This article gives you complete information about George Dockrell who is the latest cricketer in Ireland cricket team. More details about the biography, profile and short career performance of George Dockrell are quoted in this article. Read the article full for more information about George Dockrell. 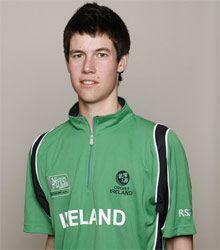 George Dockrell is one of the youngest players in Ireland cricket team. George Dockrell was born in the year 1992 July 22. George Dockrell is born at Dublin, Ireland. George Dockrell is a right handed batsman and a left arm slow orthodox bowler. George Dockrell has played only few matches in international cricket. He had not made his test match debut. George Dockrell made his ODI debut in the year 2012 April 15 against West Indies. His T20 debut was against England in the year 2010 February 1 against Afghanistan. George Dockrell just played 26 ODI matches and showed some brilliant performance in his bowling. He had taken 332 wickets in ODI cricket. George Dockrell was a member of 2010 U-19 Cricket World Cup Qualifier winning squad. George Dockrell got selection for 2010 ICC World Twenty20 and taken 4 wickets against West Indies in a group stage match. Earlier George Dockrell played for Somerset County Cricket Club at the age of 15. More details about the profile and career performance of George Dockrell in International cricket are given below. George Dockrell is one of the youngest players in Ireland team. He just played few matches in One day and T20 career. George Dockrell played 26 ODI matches and taken 32 wickets with a best performance of 4 for 35 runs. His ODI debut was against West Indies. HE scored just 68 runs in ODI cricket. George Dockrell also played few matches in T20 International cricket. His T20 debut was against Afghanistan. George Dockrell had taken 12 wickets from 7 matches with a best performance of 4 for 20. His economy in ODI cricket was 4.2 and T20 is 5.43. George Dockrell had not yet entered into test cricket.